Towne Ford has the all-new 2018 Ford EcoSport in stock now. This new Ford subcompact SUV has several innovative features that can make your commute time more enjoyable and productive. It offers enhanced connectivity with an embedded 4G LTE modem with Wi-Fi hotspot that enables up to 10 devices to be connected at once and provides a range of up to 50 feet outside the vehicle. EcoSport is also equipped with Ford’s SYNC® 3 touch screen and is SYNC AppLink™ ready with voice-recognition communications and entertainment options. These features allow EcoSport drivers easy access to navigation, inbound and outbound calls, messaging and access to variety of streaming music, podcasts and video options. 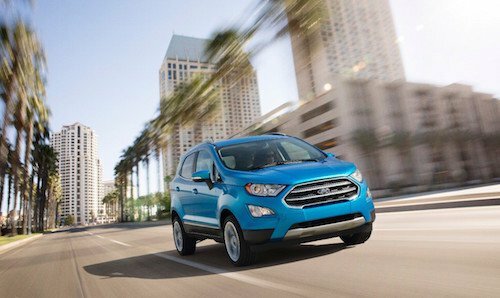 Our Ford Dealership near San Francisco has a selection of new 2018 Ford EcoSport models to choose from. Explore our new Ford inventory to see photos, vehicle details and pricing. If you would like to learn more about this exciting new Ford vehicle contact us or stop by for a test drive soon.